Stephanie Thornton: Sweet Deal on H Team Novels! Sweet Deal on H Team Novels! A DAY OF FIRE (Authored by: Stephanie Dray, Ben Kane, E. Knight, Sophie Perinot, Kate Quinn, Vicky Alvear Shecter) Pompeii: a lively resort flourishing in the shadow of Mount Vesuvius at the height of Rome's glory. When Vesuvius erupts in an explosion of flame and ash, the entire town struggles to flee the mountain's wrath: soldiers and politicians, villains and heroes, young and old. But who will escape, and who will be buried for eternity? A YEAR OF RAVENS (Authored by: Ruth Downie, Stephanie Dray, E. Knight, Kate Quinn, Vicky Alvear Shecter, SJA Turney, Russell Whitfield) Britannia: land of mist and magic clinging to the western edge of the Roman Empire. 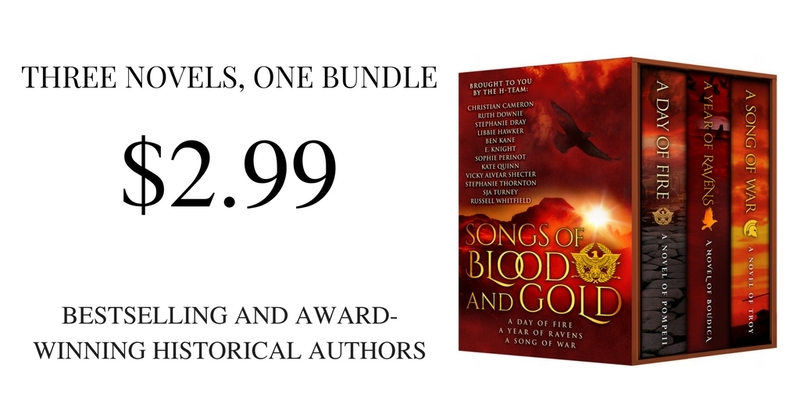 A red-haired queen named Boudica leads her people in a desperate rebellion against the might of Rome, an epic struggle destined to consume warriors and peacemakers, slaves and queens, Roman and Celt. But who will survive to see the dawn of a new Britannia, and who will fall to feed the ravens? A SONG OF WAR (Authored by: Christian Cameron, Libbie Hawker, Kate Quinn, Vicky Alvear Shecter, Stephanie Thornton, SJA Turney, Russell Whitfield) Troy: city of gold, gatekeeper of the east, a haven destined to last a thousand years. But the Fates have other planes--the Fates, and a woman named Helen. In the shadow of Troy's gates, all must be reborn in the greatest war of the ancient world: heroes and cowards, seers and kings, innocent and guilty. But who will lie forgotten in the embers, and who will rise to shape the dawn of a new age?